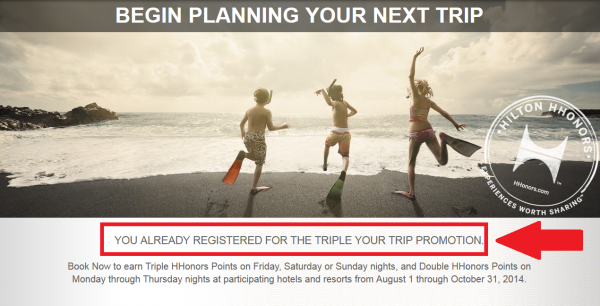 Hilton HHonors is bringing back Triple Your Trip promotion for stays between August 1 and October 31, 2014, and has now again enabled the required sign up for the promotion. You earn double points for weekday nights (Monday, Tuesday, Wednesday and Thursday) and triple points for weekend ones (Friday, Saturday and Sunday). Note there are hotels that have decided not to participate to this promotion but Hilton HHonors has not released the list yet. If your stay included weekday and weekend nights, Hilton HHonors will calculate the double and triple points based on the averaged nightly rate throughout your stay. I signed up for this offer, when Hilton first enabled it, and the registration was successful. Hilton first released this offer and then closed the registration page that is now active again. The list of non-participating properties is still missing and the frequently asked questions are for the fall 2013 promo. This is not a bad promo for those weekend nights, where you can really earn a lot of points. Remember that you can combine this promotion with any airline related bonuses that Hilton is offering and the two Conrad/Waldorf Astoria promotions (read more here and here).